1. “My authoritarian and quick manner of making decisions led me to have serious problems and to be accused of being ultraconservative." Pope Francis is speaking of his time as a Jesuit leader in Argentina in the 1970s, a difficult time for him, for the Argentine people and Argentine Jesuits. The pope is frank about what he sees as his own failings as Jorge Mario Bergoglio during that controversy-filled period. He says that he made rash and hasty decisions. Later in the interview he returns to that theme, saying bluntly that he has realized that for him the first decision he arrives at “is usually the wrong thing.” Without delving into the choices that he made during his time as a Jesuit provincial (at the extremely young age of 36, which he calls “crazy”), what strikes me about this self-examination is its brutal, almost embarrassing, candor. The former Jesuit provincial does not say, “Mistakes were made.” Or, “Things could have been done better.” Rather, he offers a blunt assessment of himself as an imperfect human being who “created problems.” Part of the Christian spiritual tradition is an “examination of conscience,” an examination of one’s moral activity. The church is in very good hands with someone able to examine his conscience not only honestly but in a radically open manner in a worldwide interview. 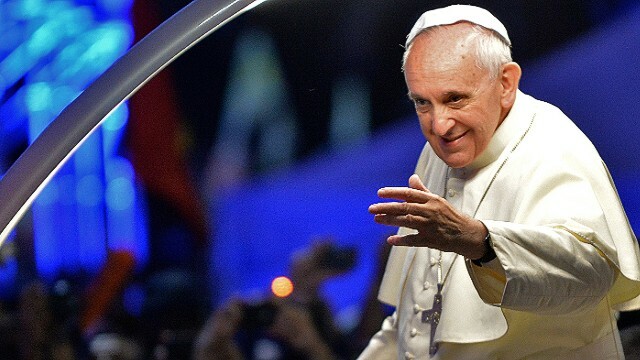 During his in-flight media conference from World Youth Day in Rio de Janeiro this summer, Pope Francis made headlines when he uttered his now-famous words, “Who am I to judge?” when asked a question about gay priests in the church. At the time, several commentators opined that the pope’s words were not only uninteresting (since the pope did not change any church teaching), they were also limited, applying only, they said, to gay priests. But in our interview, Francis speaks about gay persons in general, and he notes that his comments during the in-flight conference referred to gay persons, not simply gay priests. The new interview continues his more open, pastoral stance toward gays and lesbians. While none of this changes church teaching, the pope’s words have changed the way the church speaks to and about gay persons. And that is new. There is a reason why many LGBT Catholics have told me that they feel more welcome in the church these days. 3. “The dogmatic and moral teachings of the church are not all equivalent." This comment illuminates a part of Catholic doctrine often forgotten today by some Catholics. Theologians call this the “hierarchy of truths,” a kind of ladder of beliefs in order of importance. The simplest example is that agreeing with what your local pastor says about a Sunday Gospel reading is not on par with believing in the Resurrection. The latter is essential for belief and communion in the church; the former much less so. But when you talk about the “hierarchy of truths,” some Catholics grow uneasy, suspecting that you are watering down the church’s teaching. But the pope makes it clear that he understands this tradition. Francis also says that church teaching is not to be a “disjointed multitude of doctrines to be imposed insistently.” While belief is essential, the transmission of beliefs is not to be forced upon people. Christianity is primarily a religion of invitation, and not simply an invitation to adhere to certain beliefs, but, more importantly, an invitation to encounter a person: Jesus Christ. Francis asks Catholics to move away from a church that has “locked itself up in small things, in small-minded rules.” He invites Catholics into the world of uncertainty, which is where most of us live anyway. What may strike people is not only what Francis says in this new interview, but how he says it. Its tone is open, gentle, conversational, thoughtful and above all friendly. No, the pope is blunt. No sugarcoating here. Of course Francis knows that he is redeemed by God, and he knows he is loved by God. But he feels in his bones that he is a sinner: imperfect, flawed and struggling. As are we all. Maybe that’s what makes him so loved, and so eager to love. The Rev. James Martin is editor at large at America magazine and author of "The Jesuit Guide to Almost Everything." We have a philosopher Pope. Yet you claim to represent the truth? Exactly where in your teaching can it be found? 3. Acts 2:36 Therefore let all the house of Israel know for certain that God has made him both Lord and Christ-this Jesus whom you crucified." I see a lot of Peter there. That's a lot of emphasis for writings of unknown authorship. All three thousand blah blah... Who? What were their names? What did they write? He is loved by the WORLD! Of course now it all clicks! Satan offered Jesus the WORLD if he bowed down to him in worship, "
Jesus said to him, “Away from me, Satan! For it is written: ‘Worship the Lord your God, and serve him only. Funny that when the prior Pope Benedict said the same things about abortion, contraceptions and such....the media did not seem to notice. But now Pope Francis's words mean a shift in Catholic teachings. I just hope that the agendas of the right and the left, do not blur the message. The message of mercy and forgiveness which is essential for the foundation for all. I accidentally came upon this blog and I will be careful to avoid it in the future. The aggregate of comments reemphasizes the diabolilcal disorientation and confusion that permeates the Church ever since VAT II. So much hate on both "sides".